Apply transparency effect from 0% (fully transparent) to 100% (solid) rate to any program in Windows 2000/XP/2003/Vista/7. Show window property of application, such as window handle, class name, process id etc. 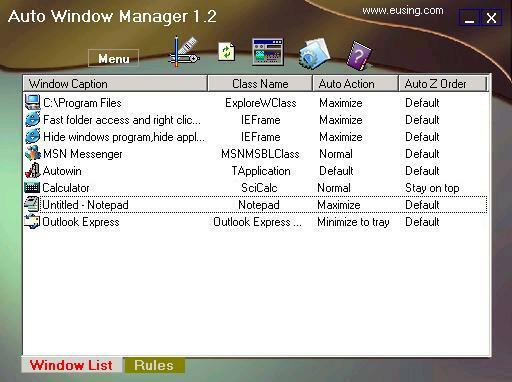 Auto Window Manager automatically manages any window you specify. For instance, some web browsers open up in a non-maximized window. Using Auto Window Manager, you can set those windows to automatically maximize (minimize, normal, minimize to tray, stay on top) every time they opened. It works with almost any program, including web browsers, Notepad, etc. Auto Window Manager stays running in the system tray, so it stays out of your way while it works. Auto Window Manager adds several menu items to standard window menu accessible via application icon in the title bar. The commands are: Minimize to system tray, always keep window on top, Set window transparency, align window, resize window. Sends the desired window to Microsoft Windows system tray (special area on the taskbar, near the system clock), the minimized window looks like a small icon there. Clicking it restores the window to its original size and places on the desktop and removes the icon from the tray. This feature lets you save your taskbar space when you have many background applications launched. Send them to the system tray and free your taskbar for your actual work only. Makes the desired window transparent. Transparency varies from 0% (opaque) to 100% (transparent): the larger is the value, the more transparent the window is. Note: This feature works only with the new generation Microsoft operation systems such as Windows 2000, XP, 2003, Vista and 7. Note: Transparency level 100% means that the window becomes totally invisible, so try it with care! Align window at position you specify. It includes top left, top center, top right, middle left, middle center, middle right, bottom left, bottom center, bottom right. You can set the width and height of any window based on your choice. Automatic refresh for Internet Explorer. If your clicking finger is getting tired reloading your favorite auction site, this function may be the answer. It can automatically refreshes websites for you. You can set it to refresh your pages at custom intervals. Each browser window has its own refresh control.